The first sign that the "off-season" of pool is coming to an end has appeared this week. Tournament director Curtis Houlden has announced the second annual Summer 8-Ball Shootout August 14-15, with play beginning at 7:30 PM on Friday. This will be played at Tailgators located in the Merivale Mall in Ottawa, Ontario. When it comes to Bar Box leagues and tournaments, Tailgators really is an a class of their own.They host several huge tournaments a year and the Summer Shootout now acts as the first tournament of the season. This will be a 64 player max handicapped event, with staggered entry fee's depending on your skill level. For those who think of themselves as "Bar Box" specialist this is the time to step up as not only some of the best players in the region will be in attendance, but the country as well. Erik Hjorleifson and John Morra frequent these events and it is a great time to test your skills against some of the best around. Tailgators is truly a premier venue with a full bar and kitchen and plenty of tables so insure the tournament runs smoothly. Get your entry in today! 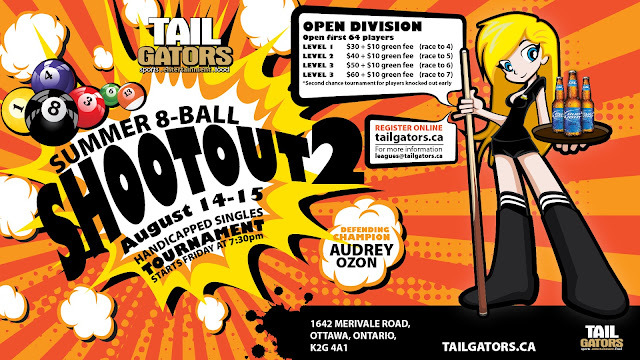 As this tournament will surely fill up, contact Curtis Houlden at leagues@tailgators.ca to reserve your spot.